All of a sudden my life is all about Coco Chanel! Lastnight I went with my mom to the North Park to see a movie about her, "Coco Before Chanel." A terrible title. You would think they would have been able to come up with something better but apparently they could not. We are talking whole board rooms of people scratching their heads. Finally: "OK, anyone got any better ideas? No. 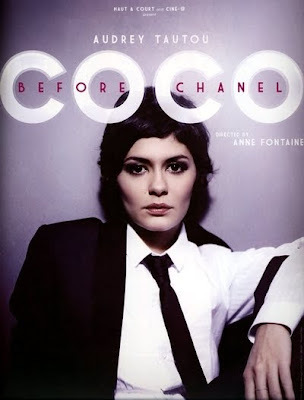 Guess we go with 'Coco Before Chanel.'" This conversation is all in French of course. ...and I thought he was vapid. 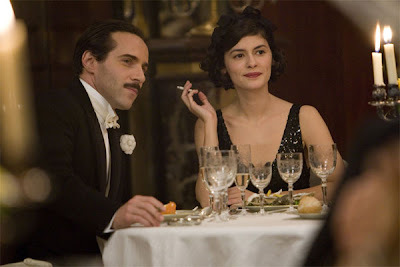 If I looked away from him though the movie was beautiful. I decided Leonard Pennario would have liked the movie. Because I went to so many movies with him and he was so opinionated about them that it kind of got under my skin and now I never go to a movie without deciding whether or not he would have liked it. But I am not sure what Pennario would have thought of the music. This is funny, just now I called the main theme to mind. I remembered it! Pennario had that talent and maybe it rubbed off on me. Back to Coco Before Chanel. First she moved in with this one guy, the chateau owner, and then she picked up with Boy, who was the first guy's house guest. That may raise our eyebrows but that is the way they do things in France. It is no big deal. Then presumably a few years later would come Stravinsky whom we wrote about yesterday. That makes three men so far in the life of Coco Chanel! On the way home my mother wanted to know who the boyfriend after Stravinsky was. I said I did not know. How about the man after that? I did not know that either. My mother said: "He would be Chanel No. 5."